The most delicious fruits are always those that are in season! We chose pears, tart granny smith apples, ruby red grapefruits, clementines, and dried dates and figs for our holiday fruit plate. Dates and figs are harvested in the fall and winter, in milder climates where they’re grown, so even though they are dried, are probably fresher than they would be other times of year. We tried 2 kinds of figs from our grocery’s bulk section: black Mission Figs and golden Adriatic figs. I preferred the black ones. Citrus fruits are harvested in the winter too, in Florida, Texas, and wherever they come from. As a former Floridian, these are some of my favorites, and I feel less guilty about eating non-local fruits in the winter, when less is available in Idaho. 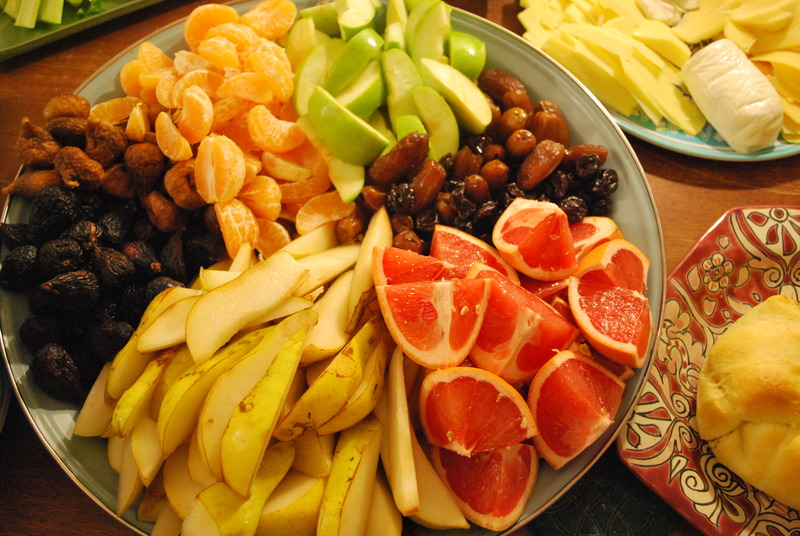 A beautiful fruit plate is an excellent remedy for holiday cookie overload. I planted a black fig (Negronne) last Spring against a Southern wall. It *should* survive the winters without any problems… cross your fingers for me because I am so looking forward to fresh figs and homemade fig newtons!